http://www.jewishworldreview.com | (KRT) CHARLOTTE, N.C.  For those who keep kosher, a taste of heaven just got sweeter: Krispy Kreme doughnuts baked and served at the store in Matthews, N.C., like a number now across America, are being prepared in keeping with strict standards of Jewish dietary law. That might not resonate with the Southern Baptist trucker drawn to a glazed doughnut and hot cup of coffee at 3 in the morning. But to many Jews, it means there is a new place to go for jelly-filled bliss. And to others, the fact that Krispy Kreme on East Independence Boulevard now keeps kosher stands as another sign that the region grows richer and more diverse by the day. 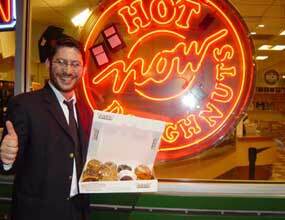 Doughnuts, says Rabbi Mordechai Roizman of Charlotte, never tasted so fine. "We're into eating well, into elevating the physical to a higher spiritual level," says Roizman, putting the meaning of keeping kosher into stark terms: "Eating something that is not kosher is ingesting spiritual poison." Roizman, 34, is the man behind the kosher doughnuts. After moving from Jerusalem with his family two years ago to lead the Charlotte Torah Center, he approached the Krispy Kreme folks a few months back. He offered to oversee conversion of the Matthews store. Right now, Roizman's only pay is enough free doughnuts for the Torah Center's programs. Hanukkah, he says, is a huge doughnut holiday in Israel. The concept isn't foreign to the Winston-Salem, N.C., company - a number of its 351 stores in the United States, Australia, Canada, England and Mexico already keep kosher. Spokesperson Robin Pfefferkorn says the Orthodox rabbi's offer to make the Matthews store one of the first of Krispy Kreme's 27 Carolinas locations to join the fold was too good to pass up. That explains why Roizman has become a regular at the store - kibitzing with manager Everett Jordan, munching on a hot one and inspecting the equipment, ingredients and staff procedures with a keen kosher eye. Not to worry: even Krispy Kreme lovers with the most discriminating palates won't be able to taste the difference in their favorite doughnut. Krispy Kreme was already using kosher ingredients made at the company plant in Winston-Salem, including powdered oil used in the cooking process. But to those who keep kosher, Roizman's 10-minute unannounced visit every few weeks means they can eat that New York cheesecake-style doughnut with a clean conscience, if a tad too many calories. While knowing that Jordan is glad to stick to the plan, Roizman verifies that all ingredients being used in Krispy Kreme products are kosher  including fillings in the new flavor-of-the-month offerings. That means no running to Sam's Club, for example, when the store runs low on cooking oil. Roizman also checks to make sure kosher and nonkosher items are kept apart. He's heard in other places where employees warmed up burritos for lunch in a toaster meant only for kosher foods. He also confirms on each visit that employees are washing their hands. You can't have a 17-year-old part-timer polishing off a Big Mac before heading back to the hot doughnut line. "They have to do that (wash their hands) anyway," notes Jordan. Much of what it takes to keep kosher doesn't apply to a Krispy Kreme. No need to worry about avoiding pork, shrimp and lobster, unless some way-out-there doughnut executive decides to use it as filling. And no need to ask the kid at the counter if animals with split hooves that chew their cuds (lambs, for example) were slaughtered in accordance to biblical law. A company that is as much a part of the Carolinas as barbecue and NASCAR respects the spiritual needs of a small group of prospective customers enough to do something about it. "It's about spiritual cleanliness as opposed to physical cleanliness," says Roizman. "When the Torah says 'I'm clean,' it means spiritually we're more concerned about our souls than our bodies." Ken Garfield is a reporter for The Charlotte Observer. Comment by clicking here. © 2004, The Charlotte Observer Distributed by Knight Ridder/Tribune Information Services.